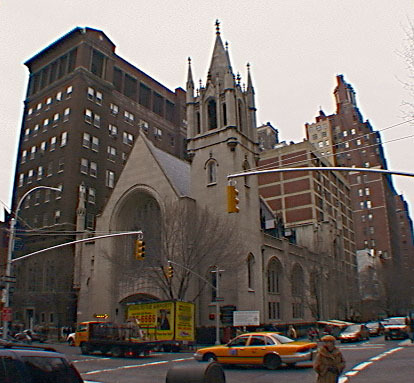 Designed by James E. Ware & Sons and completed in 1901, this Neo-Gothic church was organized in 1839 as the Eleventh Presbyterian Church and was originally located at Avenue D and East 4th Street on the Lower East Side. The congregation made several moves northward until it came to this location, which was occupied by a church, which was demolished. This church erected a large brown-brick parish house directly north of the church and it was designed by James Gamble Rogers and completed in 1917. "With a tower that would not be out of place in King Ludwig's Neuschwanstein Castle, and a nine-story Church House by James Gamble Rogers that overshadows the tower, the Madison Avenue Presbyterian Church cuts a high profile. Appropriately, some of the most powerful and influential names in New York City history are associated with this church, beginning with James Lenox - of the Lenox Hill Lenoxes - who gave this site to the Phillips Presbyterian Church, named in hor of the Rev. William Wirt Phillips. The Phillips congregation merged in 1899 with the Madison Avenue Presbyterian church and built this Gothic sanctuary by James E. Ware & Son. (Part of an earlier church on this site, built in 1869, survives as the Phillips Chapel.) Other leading figures here have included the Rev. Henry Sloane Coffin, who was pastor from 1905 to 1926 (his nephew, the Rev. William Sloan Coffin Jr., was senior minister at Riverside Church; Edward S. Harkness, Henry Coffin's roommate at Yale and a Standard Oil heir; and Henry R. Luce, the founder of Time, Inc., and son of a Presbyterian missionary, who was a parishioner. During a renovation begun in 1998 by the Rev. Fred A. Anderson, the architect Page Ayres Cowley of Cowley & Prudon discovered lovely oak triforium screens with St. Andrew's crosses under plywood panels that had been installed in a 1961 remodeling." While the main mass of the church is rather austere, the steeple finials are nice and the finials atop the windows on sloped roof along the sidestreet are splendid. Unfortunately, a very unattractive home for senior citizens just to the east of the church is an eyesore and the church's parish house itself is not a masterpiece.